New poll: If elections were held today, the left-center would win 58 Knesset seats, making it difficult for Netanyahu to form a coalition. 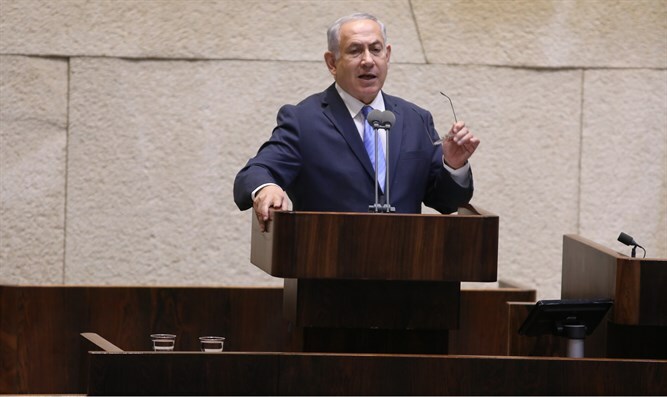 The center-left bloc is strengthening, and if elections were to be held today, Binyamin Netanyahu would have trouble establishing a government, according to a poll which was published Wednesday on Channel 12 and Channel 13. The Likud party would win 24 seats, the Zionist Union would achieve 21 seats and the Yesh Atid party would be the third largest with 20 Knesset seats, the poll found. The Jewish Home party would win 12 seats, according to the poll, the Arab Joint List would have 12, Moshe Kahlon's Kulanu would win eight seats, as would United Torah Judaism. The Yisrael Beytenu party receives six seats in the poll, the Meretz party wins five seats and the Shas party would win only four Knesset seats. A calculation of the results of the poll shows that the left-center bloc would achieve 58 Knesset seats and the right-wing bloc would have 62. This means that Prime Minister Netanyahu could in principle form a new coalition, but will find it difficult to do so. Previous polls have shown that the Likud was actually gaining strength, even after police disclosed that the ongoing investigations into Netanyahu include suspicions of alleged crimes far more serious than originally believed. A poll in August gave Netanyahu’s party 25 seats. Netanyahu’s present coalition – which includes Shas, United Torah Judaism, Jewish Home, Kulanu, and Yisrael Beytenu – also showed a net gain over the previous poll, rising from 63 seats to 66. That poll also found that Zionist Union, presently the largest opposition party, would fall to third place from 24 seats to 16. A more recent poll, released on the weekend, found that if elections were held today the Likud would win 26 seats, four less than it currently has. The Zionist Union, in that poll, would receive 20 Knesset seats, four less than its current number.